How to Design a Full-Sleeve Tattoo. A full sleeve tattoo is basically one big tattoo or a series of tattoos that wrap completely around the arm from shoulder to wrist. You can design a full sleeve tattoo that not only pleases you, but is also pleasing to the eye. All you need is an observant eye. If you want to form a sleeve by combing existing tattoos, consider the various ways you can combine them into one flowing tattoo. Tattoo artists can offer several options for connecting existing pieces by utilizing different backgrounds. You can easily turn an armful of tattoos into a sleeve by adding a background to tie all the pieces together. Some common backgrounds include smoke, flames, swirls, water, wind and Old School hotspots. If you're planning a sleeve from scratch, you have even more freedom with your choices. Study common themes used for tattoo sleeves and incorporate your own ideas to create an original pattern. Some common themes include tribal markings, traditional Japanese art, floral designs and Celtic knotwork. Pick a theme. If you're starting from scratch, choose a specific theme so the entire piece flows. This is especially important if you're putting several smaller pieces together to design one large tattoo. 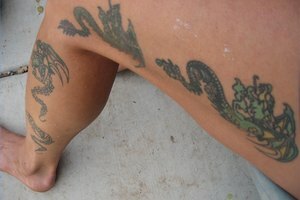 If you've already have some tattoos, decide if the existing pieces fit the theme you've chosen. If there are some that won't work, consider covering these before adding any new pieces. Find individual designs to fit your overall theme. Whether you're piecing together the sleeve with or without existing pieces, pick designs than will fit in case you change your mind, decide some pieces don't flow right or the spacing simply isn't right for certain pieces. If you're designing the whole piece from scratch, your tattoo artist should piece the entire tattoo together on paper first. Have him take a tracing of the whole arm, and then draw inside this tracing to ensure the size is correct. This way, the whole tattoo is completely designed and ready to go before you actually begin. Talk to a tattoo artist. If you have a regular tattoo artist, discuss the different design options you have for your sleeve. See if you're on the same page. If you don't have a tattoo artist in mind, talk to several different artists to learn who would be the best choice in designing and inking your creation. Schedule more than 1 session to complete a full sleeve tattoo. Completing the project could take several days, weeks, months or longer depending on the intricacy of the design, your pain tolerance and the length of each session. You also must allow time for swelling. Tattooed flesh swells, which makes it harder to get ink in and to ensure the lines are straight. There are several recommended sources online for full sleeve tattoo designs, buy most of the better sites require a fee. However, there are also a lot of free sites. Although full sleeves have traditionally been more common on men, women are also deciding to go all out with their artistic expression. If you can't decide whether you want a sleeve tattoo, wear fakes first. Make sure the tattoo studio is clean and sterile and the tattoo artist practices safe and sterile procedures throughout the tattooing process. If you are hirsute, you may not like the way your tattoo sleeve looks when the hair on your arm grows back. For the best visual effect, you might have to keep the area shaved permanently. 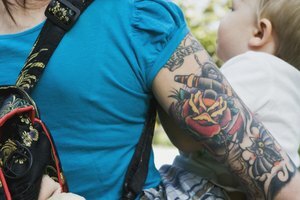 How Are 6-Month Temporary Tattoos Done?